This post was one of my first ten in this blog, which I’ve updated to reflect both changes in my posting style and substantial improvements in available data. At this point, it’s changed enough to be considered a new post. The crazy folks at The Truth About Cars posted recently about a 1985 Dodge 600 Club Coupe as part of their Junkyard Find series. There’s a strong feeling of fulfillment behind the wheel of this striking coupe. The Dodge 600 was an extended (E-platform) version of the original K-platform cars, with three more inches of wheelbase added to the sedans (coupes and wagons remained the same length as the original cars). It debuted in the 1983 model year, two years after the original K cars made it to market. Other E-platform cars were the Chrysler New Yorker, Chrysler E-Class, and (later) the Plymouth Caravelle. There were three engines available for the Dodge 600. The base engine was Chrysler’s K 99 bhp 2.2 liter/135 ci inline four with fuel injection. One option was the Turbo I 146 bhp version of the same engine with Garrett T3 turbocharger and fuel injection while another was Mitsubishi’s Astron series 4G54 101 bhp 2.6 liter/153 ci inline four with a carburetor. Fuel economy for the Turbo I and three-speed automatic transmission combination (the five-speed manual was no longer available) was 19 city/24 highway by the standards of the day (it would be 17/22 today). Standard exterior and mechanical equipment on the $9,060 club coupe (about $21,100 in today’s dollars) included power brakes, power steering, halogen headlamps, Landau padded vinyl roof, and P185/70R14 tires. Inside, cloth front bucket seats, a full-length console, color keyed steering wheel, and an electronically-tuned AM radio were standard. Features listed that wouldn’t be considered worth mentioning now included a tethered fuel filler cap and an inside hood release. Optional equipment included sport/handling suspension ($79), air conditioning ($757), tinted glass ($115), automatic speed control ($179), leather wrapped steering wheel ($50), and tilt steering wheel ($110). 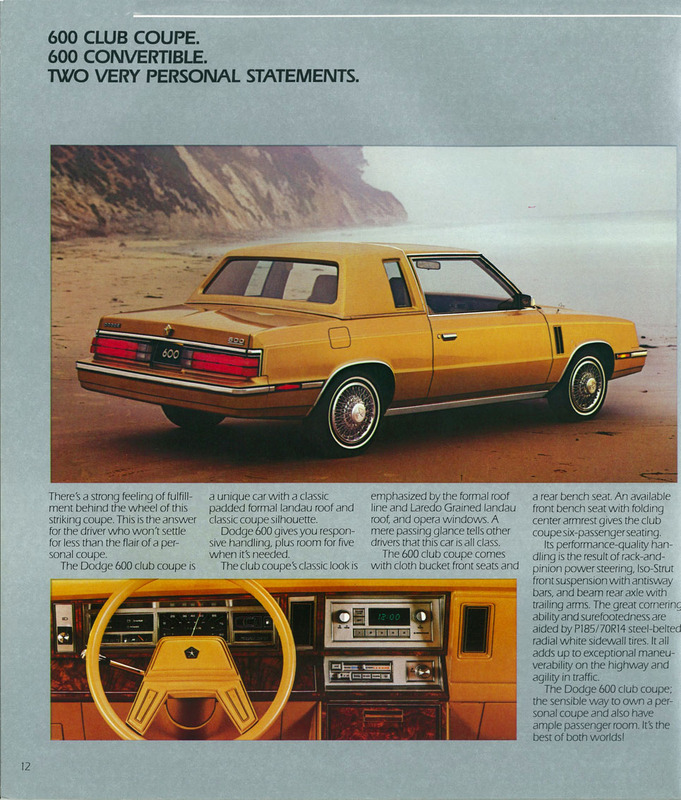 Page from the 1985 Dodge 600 brochure, linked from the Old Car Manuals Project’s amazing brochures pages. The original K cars and their many variants were once so common on the roads, but have essentially disappeared in mid-2017. I haven’t seen a 600 of any type in years, despite the fact that Dodge made over 300,000 of them between 1983 and 1988. You’ll sometimes see the original Dodge Aries/Plymouth Reliant cars at AACA shows along with the top of the line Chrysler LeBaron convertibles. You do occasionally see Dodge 600s for sale in the Hemming’s Motor News classifieds and on eBay Motors, but there are no coupes out there as I write this in July 2017.